Colm Moriarty needs a top-3 in Rome to make the Challenge Tour Grand Final and avoid Stage Two of Q-School. Photo Jenny Matthews/www.golffile.ie Colm Moriarty will bring nothing but aggression to this week’s Roma Golf Challenge where he needs at least a top three finish to qualify for the Challenge Tour Grand Final in two weeks’ time. Currently 66th in the Challenge Tour Rankings, the Glasson man needs to earn at least €11,000 this week to burst into the all-important top 45 who will then move forward to the Grand Final in search of one of the 20 available European Tour cards on offer through the final Rankings. “It’s a bit last-chance saloon again,” said Moriarty in Rome. “I have been in this position before and I know what I need to do: I have to go for every single pin and every shot this week. I have to be aggressive on every hole and hope that it goes my way and I can finish in the top three to get into the top 45. “Getting to the Grand Final would obviously be huge for me because I would then be exempt to the Qualifying School Finals, and obviously I would still have a chance of winning my Tour card at the Grand Final. Moriarty has certainly shown in the past that he can turn on the style on the big occasion. His performances in making cuts at events like last year’s Open Championship and this year’s Irish Open are testament to his ability and he hopes to acquire that ‘big event’ mentality in Rome. Should he achieve his goal of a top three finish in the Italian capital, Moriarty will join his countryman Simon Thornton at San Domenico Golf at the Grand Final in a fortnight. Thornton, currently 15th in the Rankings, has his own pressures this week as he looks to break into the top ten to guarantee the best possible category on The European Tour next season. Niall Kearney completes the Irish contingent in Italy this week, but not even a victory can take him in to the top 45. The Dubliner can, however, win an exemption to the Qualifying School’s Second Stage if he can move from his current position of 111th in the Rankings to within the top 80 at the end of the week. Simon Thornton in action in June’s Italian Open. Photo Eoin Clarke/Golffile 2011Simon Thornton kept his cool in Rome to take another giant step towards regaining his European Tour card. Colm Moriarty found form in the nick of time in Rome. Photo Jenny Matthews/www.golffile.ieColm Moriarty blasted his best round for more than 15 months to set up a European Tour card-winning lifeline at the Roma Golf Open. Colm Moriarty. 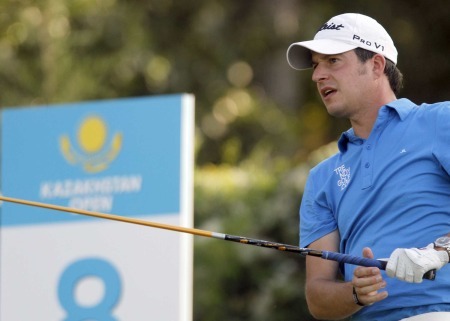 Picture by Fran Caffrey/www.golffile.ieColm Moriarty saw his bid to secure the third place finish he required to qualify for the Challenge Tour’s Grand Final come up short after an agonising double bogey seven during final round of the penultimate event of the season, the Roma Golf Open. The Glasson professional, who burst into contention with a brilliant third round 65 at the Olgiata Golf Club, holed his 96 yard approach on the first hole of the final round for an eagle two and led the tournament until the par five 15th where a double bogey seven brought a cruel end to his hopes of winning the title and keeping his Challenge Tour season alive.